Station launch: Minister for Police Lisa Neville with Member for Yan Yean Danielle Green and councillors Emilia Sterjova and Tom Joseph. POLICE numbers have been bolstered with the opening of the new Mernda Police Station. Minister for Police Lisa Neville and Member for Yan Yean Danielle Green met with Superintendent Tim Hansen on Sunday, November 19 to tour the $15 million 24-hour station. The state-of-the-art facility includes specially designed interview rooms, conference rooms, discrete public consultation facilities, high-level security and new staff facilities. It will also house uniform police officers, the Family Violence Unit, the Sexual Offences and Child Abuse Investigation Team, the Pro-Active Programs Unit and other staff. Of the 130 staff Mernda Police Station, 45 are brand new frontline officers. Ms Neville said the new station will provide invaluable policing support for Mernda. “This new police station, with the 45 additional police, will ensure that community has the police it needs,” she said. 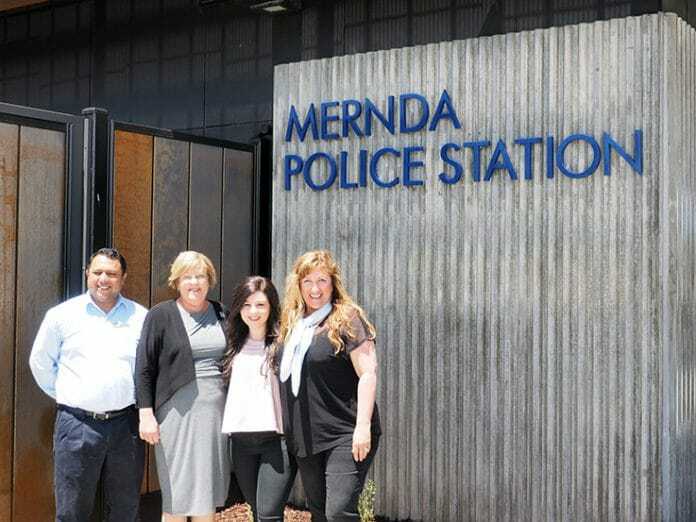 “Victorians are flocking to Mernda and the new police station will help meet the growth we are seeing and support the police response right across the area,” Ms Green added. Superintendent Hansen said Victoria Police will continue to invest in resources to boost community safety throughout Victoria. “This is a police station for the future, positioned in a key growth corridor in Melbourne’s north west,” Superintendent Hansen said. City of Whittlesea North Ward councillor and Mernda Police Station campaigner, Tom Joseph was at the operational opening and told the Whittlesea Review he was delighted for the community. “The Mernda Police Station is massive for the community. I’m so delighted for the residents of Mernda and Whittlesea,” Cr Joseph said. “When I started the police station campaign I thought we would get 10-12 officers but what the Government has delivered is huge. When I first started the campaign my main intent was to have a police presence there. “The presence of 130 officers will make the community feel safer. I believe it is a huge win for the north in particular Mernda, Doreen and Whittlesea. Prior to the opening Ms Neville and Ms Green attended the Whittlesea Police Station to address ongoing concerns regarding the closure of the station as well as reduced staffing numbers. While the Minister stated that the Whittlesea Police Station would remain open there was no real commitment regarding staffing levels. Cr Joseph said the Minister made it very clear that Whittlesea Police Station will remain open and that they would be supported by Mernda Police. Prior to Mernda Police Station opening, Whittlesea police serviced a population of 50,000 which has now reduced to 10,000. Mernda Police Station is located at 542 Bridge Inn Road, Mernda. In an emergency, contact Triple 000.